This Sunday, Ellen DeGeneres will be hosting the Academy Awards for the second time. As part of Oscar tradition, nominees in the top categories receive elaborate gift bags filled with expensive items that companies hope celebrities might use and endorse. For the past 12 years, Distinctive Assets has been putting together the “Everyone Wins at the Oscars Nominee Gift Bag.” This year that gift bag is worth $85,000, doubling the price of last year’s bag with items ranging from less than $10 to $16,000. From designer lollipops to luxurious trips to Las Vegas and Hawaii, nominees will be coming home with some pretty cool stuff despite the fact they didn’t win a statue. But the best item in the gift bag, in our eyes, is the 10,000 meal donation to homeless animals. Oscar host Ellen DeGeneres’ pet food company, Halo, Purely for Pets in partnership with Freekibble.com, is giving each non-winning Oscar nominee in the Best Actor/Actress, Supporting Actor/Actress and Director categories 10,000 meals of natural pet food to donate to the animal shelter or rescue of the celebrity’s choice. 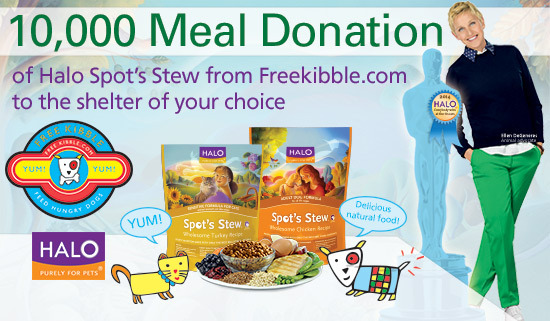 10,000 meals are roughly 2,000 pounds of Halo Spot’s Stew, which is approximately $6,100 in retail value. Will your favorite shelter be nominated? This entry was posted in News and tagged Ellen DeGeneres, Freekibbe.com, Halo Pets, Oscars 2014 on February 28, 2014 by Belkis Cardona-Rivera.